I am 3 days into the 21 Day Fix and feeling incredible. Although I know I shouldn't be weighing myself, I did. I am down 2 lbs and am seeing minor changes in major places. That's amazing progress for 3 days worth of work. I was feeling so inspired this afternoon that it didn't occur to me I might have a hard time during my first training run in ages. I laced up my shoes, put on my watch, turned on my music, grabbed my phone and headed out the door to smash 2 uphill miles. One minute into my run my knee started hurting. Two minutes into my run my confidence was shot. Three minutes into my run I changed course completely and ran away from the hills, not towards them as I had intended. 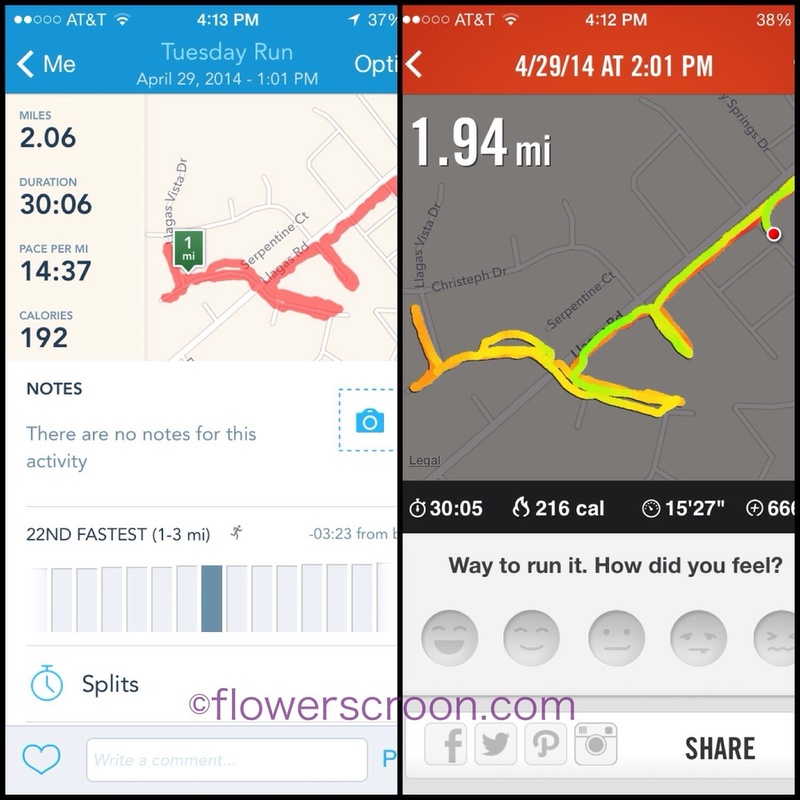 No matter which data is actually correct, RunKeeper or Nike, my run was dismal and my results were less than stellar. This is it. I gave it my all, and this is my absolute best. How can I run a half marathon on pace if I am struggling to run two miles? So which is my pace: 14:37 or 15:27? I have always said that there is no such thing as a bad run. I still wholeheartedly believe that. But today was a struggle. Every step, every second, every minute, every breath. I was deeply disappointed in myself because I knew it was my fault. It was not that long ago that I had regained control of my health & fitness by starting the Insanity program, eating cleaner and adding energyBits into my diet. I ran my fastest, strongest 5K ever by accident - in new shoes, a long sleeved shirt and a santa hat - without even trying. Today I realized that I let all that training, hard work and strength whittle away. Instead of nurturing my progress and pushing myself to achieve everything I am capable of, I started celebrating too soon and took a long break. When I came home from my run the first thing I noticed was the beautiful bag of chocolates I received from Ghirardelli, perfectly placed on my desk. Waiting for me. I thought to myself, "I can eat a few and stop the 21 Day Fix, stop the training and start again next week. It won't matter". That would be the easy way out, and Lord knows I never take the easy way out. Thursday is my next short training run day, and I have no expectations - positive or negative. What I am going to do is start foam rolling again, start stretching again and continue on my 21 Day Fix program. I gained this weight and I can lose it. I lost my strength and I can regain it. Did I eat the bag of chocolates? No. Instead, I decided to accept responsibility for where I am today. It's important to hold myself accountable not just for my successes, but for my failures as well. We all have struggles. I didn't start out as a (fast) runner. My journey isn't just about speed or a number on a scale. It is about health, progress and truth. What are your struggles? What is your journey?